These Pet Rescue level 211 cheats and tips will help you beat level 211 of Pet Rescue. 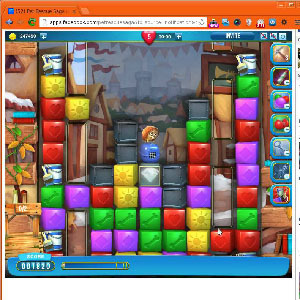 The objective of Pet Rescue level 211 is to save 2 pets and get 23,000 points. Use the paint cans in Pet Rescue Saga level 211 to open your pets’ carriers. It’ll be the only way to open them since there is a diamond in between your pet carriers and there are no like colored blocks on the board. So, use the paint can to stretch from the side columns to the middle column with the carriers. Once your pets are free, continue to use the paint cans to bring your pets down the board. Simply use the paint cans from the sides and match blocks under your pet. Your only real concern here is the middle column with your pets and paint cans. Forget about the metal blocks and everything else. Just focus on getting rid of the blocks under your pets.